When Zach and Natasha Hamilton met their son Josiah in a foster care interview, they fell in love. They also recognized there would be challenges ahead as they fostered and adopted him: Josiah was born premature and has cerebral palsy. He spent his first year of life in the hospital and struggled connecting with his caregivers. It didn’t take long for Zach and Josiah to start bonding. They were playing together within minutes of meeting and their relationship grew as they spent time together. The process was not as easy for Natasha, however. Josiah didn’t seem to want to connect with her, and their relationship was strained. 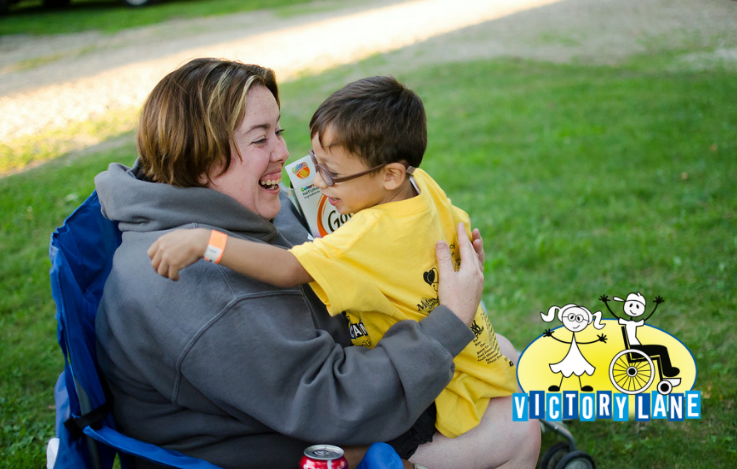 Soon after bringing Josiah into their family, the Hamiltons were introduced to Victory Lane and attended the first camp session as a Victory Family. They were apprehensive about attending because they were still figuring out how to best care for Josiah. Those feelings were short-lived as they settled into life at camp. During this camp, the Hamiltons got to know the Hedricks who attend their church. Mike, Anita, and Chad became like extended family to Hamiltons. But while Natasha appreciated these enriching and lasting relationships, she and Josiah still struggled to connect with one another. The second camp session they attended at Bradford Woods is where Natasha began to see a breakthrough happening. Over the years, the Hamilton family has continued to grow in numbers as well as involvement in Victory Lane. They have attended camp as a Victory Family, a Serving Family, and as Family Crew Chiefs. Natasha continues to serve on the Camp Programming Pit Crew.